Freshman Tyler Carter remembers his terrible twos, ripping his diaper off and running away from his parents. Looking for a way to release this energy, Carter’s parents pushed him to run track. Years later, Carter is now a versatile, talented athlete on the men’s track and field team and a National Association of Intercollegiate Athletics (NAIA) national qualifier. 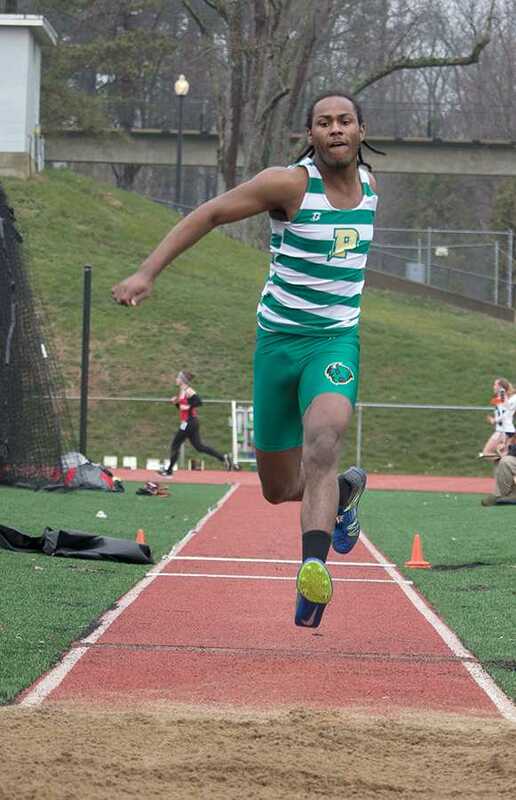 After receiving a gold medal in his junior year and silver medal his senior year for the triple jump event at the Pennsylvania Interscholastic Athletic Association (PIAA) Outdoor Track and Field Championship, Carter set his sights on a Division I school. Unfortunately, Carter fell just short of the required SAT score. Although Point Park was Carter’s last choice, he appreciates the program’s progression in just three years, the talent of his teammates and the persistence of the coach. Carter played basketball for four years, soccer for one year and has stuck with track and field since the age of five. He competed in multiple events in high school. He ran the 110 meter hurdles, 300 meter hurdles, 400 meter dash, 4×400-meter relay, long jump and triple jump. Carter now only competes in the long jump and triple jump. Head coach Kelly Parsley believes otherwise. Prior to track meets, Carter claims he does not get nervous. He’s incredibly quiet and secretly competitive, according to Parsley. “Because he is so quiet, you probably think, ‘oh, he’s not that good of an athlete,’ but then you see him out on the track, and you’re like, ‘wow this kid is special,’” Parsley said. Parsley remembers watching Carter compete during his childhood. Carter qualified for nationals during the first indoor and outdoor meets. Fellow teammate and sports, arts and entertainment management junior Jryi Davis joined Carter at the NAIA National Indoor Track and Field Championship. Although the teammates joke around, they respect each other’s talent. Carter enjoys the friendly rivalry to become the best athlete he can be and destroy the competition. Away from the track, Carter enjoys being around friends and playing basketball. He can also be found in the classroom studying history. With an additional minor in education, Carter believes becoming a history teacher may not be so bad.